For a second time I’ve assigned with read with my classes Winston Graham’s Ross Poldark: A Novel of Cornwall, 1783-178, and it has again gone over very well. We again had what were undoubted two of the best talks I had all term: one was on the treatment of Demelza versus the treatment of Verity which got the whole class discussing these characters, their scenes, issues involved; this and a talk on Ross as hero were done by students with thoroughly marked up copies. The third speaker was just chuffed to find feminist talk/discourse in the 18th century — and “by a woman’ said she amazedly. She found passage by Anna Barbauld’s niece, Lucy Aiken. I did have quotations from both Paine (Rights of Man) and Wollstonecraft (Rights of Woman) ready. A student I fully expected not to show, not only turned up for the talk, but brought a thoroughly marked up book. A second had gone through the mini-series and put on scenes for us to watch and then directed our attention to the book. She didn’t have a real thesis, but her choices were such, it left us much to talk about. Better yet, or just as important and a real improvements: I’ve integrated the book with the TV mini-series (with Robin Ellis and Angharad Rees). After analysing single books with one-shot films, we moved onto books that are part of series and a mini-series. All term long I set comparative papers, comparative talks, screening features as well as films. One area we’ve begun to discuss is the long TV mini-series, or the experience and art of watching the serial instalments of a multi-hour story, and I invite my students (and all readers) to read and comment. The following comes from viewing many many mini-series over years (especially my study of the Pallisers), but most recently Poldark, Small Island and Downton Abbey. It’s heavily indebted to Robert C. Allen’s “A Reader-Oriented Poetics of the Soap Opera” found in Marcia Landry’s Imitation of Life, an anthology of film studies. I write this blog to help my students in the last part of our term together. To study a season-long mini-series, one must take into account three kinds of time: 1) story duration: the days, months, years, depicted in the narrative. 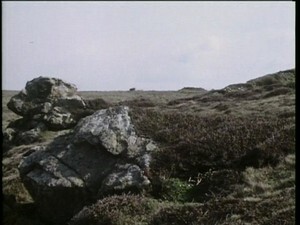 Say in Poldark, Episode 1-4 (Ross Poldark more or less); 2) text or film duration: how long it literally takes to watch (how many parts) — so how much of your life has gone by over the course of watching the sequel, and 3) the actual time it takes to read the text or see each film. In TV mini-series the happenings become inter-involved with our lives. There is not an ending of one story, without the beginning of another and sometimes quite different one —though linked thematically. Further, the first doesn’t really end, but carries on, from a different angle, and the actual central tensions of the part of the story we were intensely engaged in are not resolved or got over, but only deferred into a kind of stasis. Then we have sub-stories which turn up in individual episodes, back-stories (a form of flashback) sometimes self-contained in one episode and sometimes not. There are stories that are set adrift to be heard of no more, except maybe in passing; there are different sets of interrelated characters, and as the viewer watches for over a year, and his or her life alters, so time moves inside the series and the characters age, some aging, some disappearing altogether, some dying. The community is self-perpetuating, self-preserving system; who a character is is as much a function of his or her place in this paradigmatic system as what he or she does over the course of the sequence. Both Poldark and Downton Abbey are unusual in the large number of central characters they have: around 16. Relationships between characters in soap operas are out of kinship, romantic, and social; it’s only political when war or some large public event outside our characters’ horizons. A large community of interrelated characters, yet a limited cast of characters to whom things happen. The shots of a story move along in a sequence at a leisurely pace; it feels dignified. At the same time, there are no limits to what can happen to a character because future of soap opera is open-ended; they can be killed off and everyone else carries on. There’s also a high degree of redundancy, a reiteration of the story and ideas about the characters; the story must not be moved along too quickly lest it be used up (p. 503) and yet not go too slow. The journey forward is not only deferred, but also halting rather than continuous (p. 509). There is an attenuation of events rather than compression. This is part of the deferred structuring which brings out multi-plot structure: parallel and contrasting stories. The community has interior worlds everyone assumes, is part of, understands. Central ritual events (often a wedding, can be a dance or ball, a concert, a prayer meeting) occur when we meet all the important characters in one place whose underlying function there is to reassert their place with the others, and the relationship of all of us to the past or present (or future – but that’s crystal ball gazing. Each individual episode is often artful in itself, with its own climax and particular themes. String a series of these along and you have a horizon of themes, and that derives from a specific book. Say Episodes 1-4 of Poldark have as horizon the world of Ross Poldark (1st Poldark novel), and Episodes 1-5 of Pallisers have as horizon Trollope’s Can You Forgive her? ; then Episodes 5-9 have as horizon the themes of Demelza (the 2nd Poldark novel), so episodes 6-11 have as their horizon, Phineas Finn (2nd Palliser book). The last of each usually brings in material from the next book as horizon changes. The action is seen against this new horizon set of themes. A group of houses, compared and contrasted, say 3-4, against a wide sky but nonetheless single county- or city-side, a landscape. 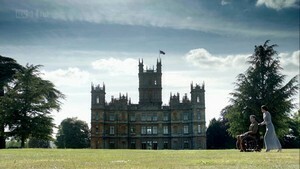 Northern Landscape, Downton with small figures of Lady Mary (Michelle Dockery) pushing the wheelchair of Matthew (Dan Stevens) — the very first shot. There are gaps in narratives. Viewers use these gaps in instalment publication to imagine what happened, to fill in. Characters themselves may change a great deal and also have new relationships to one another: so not that character-dominated, an ensemble with a lack of overall narrative closure, complicated and slowly evolving network of character relationships. The consequences of action are therefore more important than any action itself. Some small particular matters: the kind of artistry is often theatrical not dramatic, pictorial, and paradoxically can concentrate on a small emblematic details: Ross pulling a coin from Demelza’s palm so she cannot get herself an abortion, Sarah Obrien putting a cake of soap on the floor of Cora, Lady Grantham’s bath so Cora will slip, fall, miscarry a possible new heir. See The Pallisers, Poldark, Downton Abbey; aesthetics of soap opera defended. on April 19, 2012 at 4:39 am | Reply The Dickensian dimensions of modern mini-series.